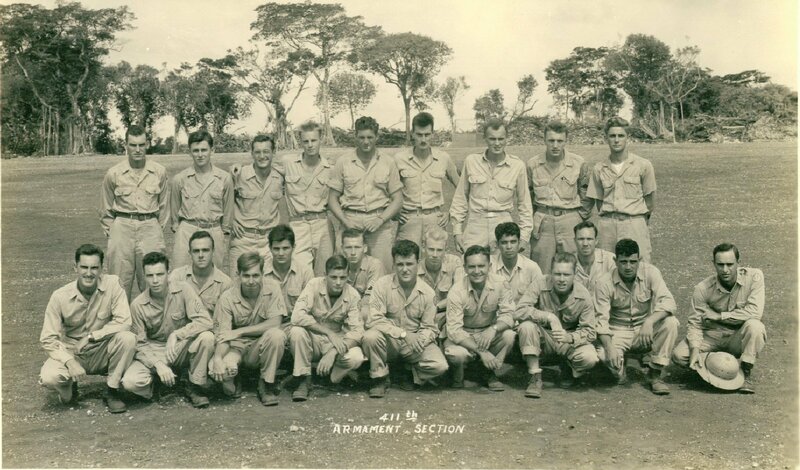 I'm always looking for photos, documents, memoribilia or personal stories relating to the 315th Bombardment Wing. See contact information at the bottom of this page. Northwest Field, Guam, circa 1945. Dedicated to all of the aircrews who flew the Boeing B-29 into harms way and to the ground crews who kept the planes flying. 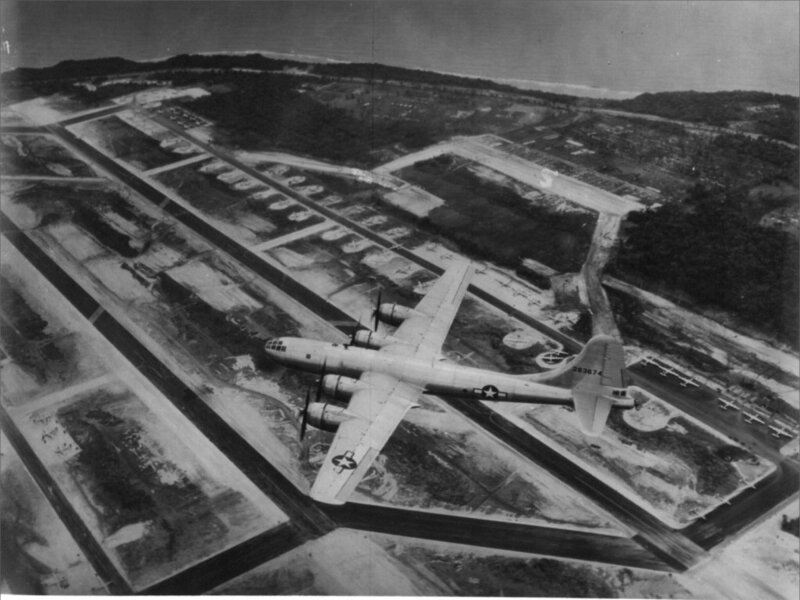 B-29, tail number 42-63674, in flight over Northwest Field, Guam. Records indicate this particular bomber was assigned to the 315th Bomb Wing, 501st Bomb Group. The 315th Bomb Wing was under the command of Brigadier General Frank Armstrong. The first units to arrive at Northwest Field were personnel of the 315th Wing HQ, 16th and 501st Bomb Groups in April, 1945. The 331st and 502nd Bomb Groups arrived in May, 1945. There were two airfields on the northern end of the island of Guam in the Marianas Island Group. They were North Field and Northwest Field. North Field, now Andersen Air Force Base, was on the north east end of the island near Pati Point and Northwest Field on the north west end of the island near Ritidian Point. North Field hosted the 314th Bomb Wing. The former Northwest Field is now an auxiliary field for Andersen AFB. Northwest Field underwent construction in 1944-1945 and became the home of the 20th Air Force, 315th Bomb Wing. The first B-29s arrived there in May of 1945 after undergoing crew training in the states. Units were formed at Dalhart AAF, Texas. From Dalhart, personnel were assigned to their training bases for crew training. The field ultimately had two runways, the north and south runways. The south runway was the first to be completed. However, when the first 315th aircraft were deployed to Guam, the south runway was still under construction and they had to land at North Field. When the main air echelons of the 16th and 501st Bomb Groups arrived the south runway was complete, but the taxiways were not. Aircraft had to be towed to their parking spaces over the rough coral. By the time the air echelons of the 331st and 502nd Bomb Groups arrived, both runways were complete. The 331st Bomb Group used the ramp space in the upper center of the photo and the 502nd Bomb Group, the area on the right in the photo. The 16th and 501st Bomb Groups used ramp space that was to the left of the photo above. In the photo the south runway is at the left side and the north runway about in the middle. The prevailing winds caused aircraft to take off to the east, in the photo above, from top to bottom. Other aerial photos of North West Field may be found under the left side of this page under menu item "Photos". General Earl Johnson's archives, found at b-29.org website, also has a photo of the field. Construction was accomplished by the Army Air Corp 1865th Aviation Engineering Battalion and Navy Construction Battalions (SeaBees). Deployed ground echelon personnel also assisted in construction, prior to the arrival of their Groups air echelon. ed: I have since found out that the 315th did not entirely consist of the B-29B. Bill Mathay, navigator on Jughound Jalopy, related that when they arrived at Kearney, Nebraska to receive their flyaway aircraft, they did not have enough of the new B-29B's for all the crews. Several crews received instead, B-29A training aircraft from Grand Island AAF. These aircraft were stripped of armament except the tail gun and equipped with the APQ-7, Eagle RADAR. Having searched for web sites relating to the 315th Bomb Wing, I found very little consolidated information about the wing. So, using information from various sources, which I have tried to give credit to in the "Other Data" link on the main page, I cobbled together this webpage for the 315th Bomb Wing and Northwest Field.